Mark Griffiths is new Honorary Doctor and Professor of ELTE - Faculty of Education and Psychology . :: www.ppk.elte.hu :: NEWS ::. Mark Griffiths has been one of the most often cited, most productive and major researchers of his field in the past three decades. He graduated with a BSc in psychology in 1987 then was awarded his PhD in Psychology in 1991. He has been a member of the British Psychological Society since 1987 and was awarded a Fellowship of this prestigious professional body in 2006. During his lecturing and research career he has gained professional respect in many British and foreign universities. 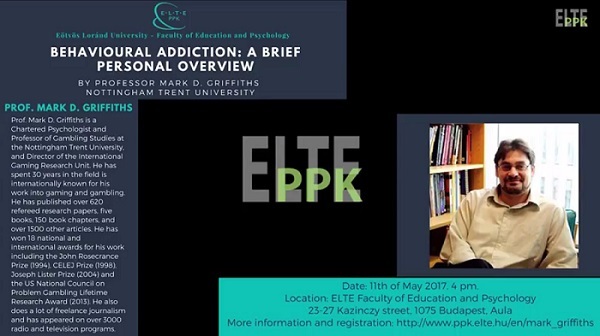 After his years at Exeter University and the University of Plymouth he moved to Nottingham Trent University in 1995, where he has worked since and was awarded a Full Professorship in 2002 at the age of 35 years. Among other universities he has also has Visiting Professorships the McGill University in Canada and the University of Western Sydney in Australia. Professor Griffiths has received 18 prestigious awards for his research, teaching, and dissemination including the International Excellence Award from the Canadian Responsible Gambling Council in 2003, the Excellence in Teaching of Psychology Award in 2006, which is the highest teaching honour of the British Psychological Society, and in 2013, he was presented with a Lifetime Achievement Award by the US National Council on Problem Gambling (NCPG) in recognition of his dedication and exceptional research on the topic. His relationship with our university is based not only on mentoring our PhD students but we have also developed further cooperation in research, with over 40 shared publications, and teacher exchanges between our universities due to his sustained collaborative contribution.